The Oregon League of Minority Voters seeks to empower communities in the process of collective decision-making and deliberation for the common good. The nonprofit and nonpartisan agency is focused on promoting a broader understanding of public policies that uniquely impact people of color. OLMV is governed by a board of directors – a group of dedicated leaders – from our community. 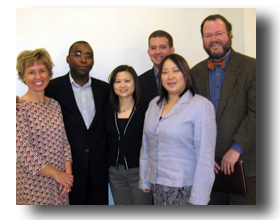 OLMV serves as a liaison between communities of color, policy leaders and institutions. Founder and Executive Director Promise King shares the work of OLMV in his own words. The Oregon League of Minority Voters’ vision is based on the ideal that communities of color ought to have representation when it comes to public policy formulation. Ideally, the representation of various groups in our democracy will showcase different ideas, views and platforms. That doesn’t always happen. Our goal is to empower and enable people in our community – regardless of socioeconomic, racial or ethnic background – to have a say in our democracy. Secondly, we want to create capacity for our communities to hold dialogs and debates about issues that uniquely impact all communities of color. For the most part, people of color are absent or underrepresented in the formulation and development of public policy. This results in lack of lasting solutions for issues that all communities of color care about. The presence of people of color delineates the complexity of solutions. When you have everybody at the table, solutions that benefit our communities are easier to formulate and develop. You get a broader pool opinions, and eventually, stronger buy-in from all communities. OLMV is investing in the future of communities of color in Oregon. There are disparities in achievement and access to resources and services: how do we close the gaps? When people are involved in public policy development, we can all move forward together. We want to create opportunities for our communities to talk more broadly about how we can reduce disparities. Through our Campaign for Equal Policy, we are promoting a broader understanding of public policies that uniquely impact people of color. One of the ways we reach out to community is through signature debate teams. We want to groom young leaders of color and equip them with the ability to espouse ideas in a public forum. We believe in training leaders who can communicate and represent ideas, issues and needs among communities of color. In promoting participation in the democratic process among our young people, we don’t simply want to groom spectators; we want to develop participants. To that end, we’re working with a number of high schools in the area, such as Jefferson and Forest Grove, looking for students from various racial and ethnic backgrounds. We want to provide the gift of oratory and communication. We’re concerned about health care disparities, as well as gaps in achievement among students of color. We’re concerned about workforce development and small business growth. In the fall, we’re convening the “Summit on Poverty.” We feel that the lack of opportunities around education, income and health often lead to poverty among communities of color. We want to shine the light on solutions and collaborations that would help address issues. One of the challenges we have is overcoming the age-long complacency of those who believe that the end goal of community political engagement is getting people to register to vote. OLMV is more interested in getting people to participate in policy development work. We want to be able to advise public officials and others in charge of formulating public policy about issues affecting communities of color. We recognize that among immigrant communities of color, linguistic barriers are present. Many also come from a cultural background where authority is rarely challenged: people go along to get along. We’re also working hard on rallying all communities of color around core issues that we all agree upon. Every time we present our vision to different communities, we have gained supporter and allies. Communities recognize that we must bind together to present a united front. OLMV includes many leaders from the majority community who cares about these issues. Our strategy has been to highlight commonalities among the problems and issues faced by our communities. I was born in Nigeria, lived in Europe, and grew up in a very privileged background. All my life, I’ve lived around people who never had the opportunities I have. Those opportunities gave me the confidence to challenge injustice without fear. I have worn many hats in advocating for issues affecting people of color. A commitment to fairness, civil rights, and social justice: those are the values that define me. I have always been passionate about community advocacy, journalism and politics. I worked as a reporter for The Portland Observer and The Skanner newspapers. I also worked for the Urban League of Portland as a vice president of communications and program development. From the Urban League, I served as Chief of Staff on the administration of Rep. Debra Khafoury, and was senior policy adviser for State Treasurer Randy Edwards. When I left Salem, I started writing for The Portland Tribune, as a columnist dealing with issues on politics and race. I joined Dan Saltzman’s staff as senior policy adviser. When I came to this country, I was very naïve about racial issues. All my life, the issues I encountered have been about class. One’s identity is defined by his or her socioeconomic status. Here in the United States, you are defined and classified – first and foremost – based on the color of your skin. Beyond a biological classification, I realized that race is a political classification in this country, which makes issues surrounding race more complex. My stint with the Portland Observer covering the relationship of the African-American community and its relationship with City Hall and other government agencies exposed me to many instances of discrimination faced by communities of color. I saw that there are many passionate people out in the community who are set on dismantling the system with their goodwill and compassion. I became resolved to align myself with people who have a desire to champion social justice, equality and civil rights. In doing this work, I have the opportunity to meet with wonderful Oregonians who share the vision of change, equality and togetherness. They believe that even in the darkest hour of our division, there is a need to come together across boundaries of race and class. These are the people that really get me excited about this work. the responsibility of good governance rests on the shoulders of all citizens. Citizenship requires knowledge as well as the ability and will to act. The rights of both majority and minority citizens are interdependent. Campaign for Just Policy is a strategic media program that promotes public discussion about issues of high importance to minority and low-income communities in Oregon. The Oregon Minority Political Summit is a conference that convenes minority leaders, other key public and private sector leaders, and community members on an annual basis to meet and discuss issues relative to public policies and Oregon’s minority communities. The Get Out the Vote Campaignis an initiative designed to increase the numbers of people in minority communities that participate in local, state and national elections. The OLMV Community Luncheonsare designed to provide a forum for minority leaders to gather and discuss their policy priorities, and to have a platform to educate and talk honestly about public policies that promote inclusion and diversity. The High School Debate Teamis an initiative that organizes debate teams at Oregon high schools with significant minority populations. The debate teams are designed to encourage the next-generation leaders to develop their own voice and increase their involvement in public debate.